1.Tap the victim on the shoulders while talking to him/her to see if he/she is responsive. 2.If there is no response, or if you are not sure what to do, shout for help, and ask people nearby to call 119 and to bring an AED (automatic external defibrillator). 3.Check to see if the victim is breathing. Observe the victim for approximately ten seconds, checking the movement of the chest and stomach to determine if he/she is breathing normally. 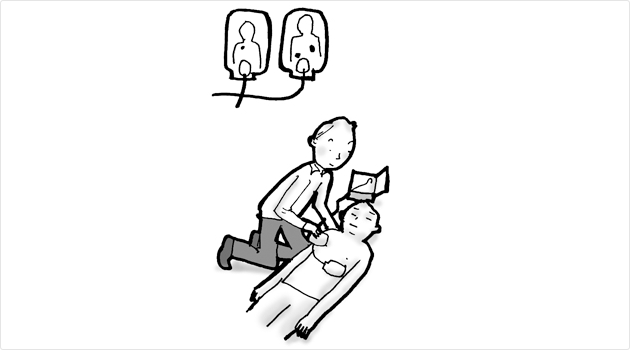 4.If the victim is not breathing normally, or if you are not sure what to do, administer thirty rapid chest compressions as shown in the illustration. Compress the middle of the chest. 5.If you have the training and the will to do so, perform the chest compressions, and give two breaths of artificial respiration. Breathe twice into his/her mouth within about one second until you see the chest rise*. Use an artificial respiration mouthpiece if one is available. Note: Although the risk of contracting a contagious illness even without using an artificial respiration mouthpiece is reportedly very low, using the mouthpiece or something equivalent is safer from the perspective of preventing the spread of contagious illnesses. Repeat the cycle of thirty chest compressions and two breaths of artificial respiration. Note: Some AEDs are designed to turn on automatically when you open the lid. 7.Attach the electrode pads to the victim’s chest. Attach the electrode pads securely according to the illustration shown on them. If the victim’s body is wet, please dry it with a towel or other absorbent material. Note: Use electrode pads designed for children up to about six years of age if such pads are available. If no child-specific electrode pads are available, use the regular adult electrode pads. 8. The AED will assess the need to administer an electric shock. Do not touch the victim’s body while the electrocardiograph is making its analysis. 9. If the AED indicates that a shock must be administered, press the shock button. After making sure that no one is touching the victim, press the flashing shock button. After the shock has been administered, follow the instructions of the AED voice recordings (which will most likely be in Japanese). Continue cardiopulmonary resuscitation or AED procedures until the victim becomes responsive—such as showing signs of discomfort—or starts breathing normally. If first aid workers arrive while you are doing so, they will continue first aid procedures. •Press the cut with a thick gauze or cloth (tissue paper and cotton are not suitable). •If blood is bursting out, press hard on the artery closest to the cut and the heart using yours fingers. The patient should keep quiet in bed. If he/she must be moved for unavoidable reasons, the broken bone should be fixed beforehand. The burn should be put in clean water as soon as possible and cooled for more than 15 minutes. Place a piece of gauze or cloth on the cut and tie it up with a triangular bandage or a roller bandage.